Classical Net Review - Viva Verdi! 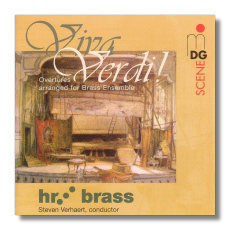 This collection of pieces from familiar repertoire takes on an interesting turn in these brass arrangements that are full of colour and verve. The 'Fledermaus' is in an interpretation by Hans Reiner Schmidt and is very striking in this guise. A Verdi medley then follows with several pieces from 'Nabucco', 'Il Trovatore', 'Rigoletto', 'Aïda' and 'Traviata', surely a feast of music if there was any! An obscure work by Gimenez entitled 'La Boda de Luis Alonso' then follows with another pot pourri of melodies from Mozart's 'Die Zauberflöte' surely the highlight of the disc. Further fine arrangements of Rossini's 'L'Italiana in Algeri', 'Che Gelida Manina' from the evergreen 'La Bohème' then follow. However the wonderful 'Gypsy Baron' Overture must surely take pride of place as an ideal conclusion to this splendid disc. Although one could argue that it is not purist enough, the entertainment provided is most certainly there!